Ninety-six elephants are killed every day in Africa. Elephants are being brutally slaughtered by poachers for their tusks and other body parts. These magnificent animals desperately need protection. 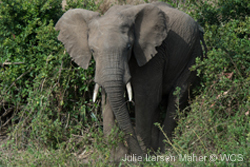 Tell your legislators that elephants matter to you and to this world – and that Congress must help protect them by reauthorizing the Multinational Species Conservation Funds (MSCF). There's no time to lose – if the MSCF isn't reauthorized, crucial programs that protect elephants from poaching and other threats could disappear. As a constituent and as a supporter of the Wildlife Conservation Society who is greatly concerned about the dwindling populations of elephants, tigers, and other endangered and threatened species, I'm writing to urge you to cosponsor legislation introduced by Reps. Don Young and Alan Lowenthal to reauthorize the Multinational Species Conservation Funds (MSCF), which are key bipartisan conservation programs administered by the U.S. Fish and Wildlife Service (USFWS). The Multinational Species Conservation Funds have helped to protect some of the world's most endangered species such as African and Asian elephants, tigers, Sumatran rhinoceroses, great apes, and marine turtles. I'm worried that we are losing our biological heritage. Extinctions are happening 100 to 1,000 times more quickly than the natural rate, and unless we alter course, 60% of the earth's species may disappear by the end of this century. Every species and subspecies protected by the MSCF continues to face significant threats, but this U.S. government investment provides critical interventions to populations that still exist in the wild. Without support from programs such as the MSCF, these animals could have already disappeared from our planet. I understand that it is a tough fiscal climate. But the MSCF represents an inexpensive, efficient program that provides benefits well beyond its stated objectives. MSCF investments consistently leverage 2-3 times as much from partner governments, local NGOs, international conservation organizations, and private businesses. These are critical programs for protecting the world's most charismatic species. I urge you to cosponsor this legislation and join in the bipartisan effort to save wild populations of these important species. Thank you in advance for your support of these important programs.